LusterStone® is a low luster metallic plaster. Easily applied by trowel, LusterStone® is unsurpassed in its dimensional, beautiful decorative results. The very act of application does the decorative work for you, forming soft metallic plaster high and low effects and reflective patterns. No burnishing is required! LusterStone® metallic plasters are available in many stunning metallic designer colors. You and your walls will love the handsome look of LusterStone®! LusterStone® is the professional choice for quality and beautiful results. Try LusterStone® on your next decorative finishing project and see for yourself why so many professional decorators and finishers are raving about this product. Palette Deco™ Metallic is a water-based, durable, paste-like material that can be applied by roller, brush or even by a sprayer with the proper equipment. It also can be applied by trowel, spatula or palette knife. Palette Deco™ Metallic is very durable and in most cases does not require a protective topcoat. Palette Deco™ Metallic has excellent reflective qualities when dry, which helps create beautiful contemporary metallic finishes, including embossed patterns, sophisticated stripes and dazzling combed effects. StucoLux Shimmer™ All the great qualities of StucoLux with a subtle shimmer/sparkle……simply gorgeous! StucoLux Shimmer™ is a decorative, easy polishing mineral-based Venetian plaster. A creamy, smooth material, it glides on easily across most substrates. StucoLux Shimmer™ has very good interior and exterior durability and provides beautiful undulations of color depth in the final finish. StucoLux™ Hi Lites are a light weight, buttery smooth, fast-drying, high sheen, iridescent, mineral-based Venetian plaster. This material is easy to apply by trowel and glides across virtually any substrate. When burnished it provides a dramatic high gloss effects! StucoLux™ Hi Lites have very good interior and exterior durability and provides beautiful undulations of color depth in the final finish. Fast and Easy Venetian Plaster success. Available in a full variety of iridescent colors. Sold in 16oz, quarts, and gallons. 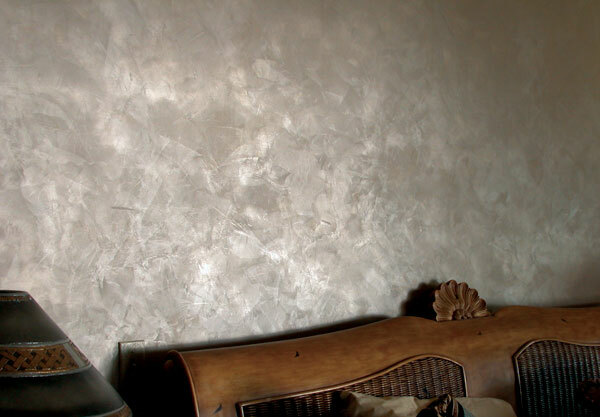 Olde World Fresco® Metallics produces the look and feel of Old World fresco plaster. A translucent, dimensional coating which dries to a hard, durable finish.